Explore the common ground—and the important differences—between bisexuality and transgenderism! This book, guaranteed to provoke debate and discussion of sexuality and gender, is the first devoted exclusively to the relationship between transgenderism and bisexuality. 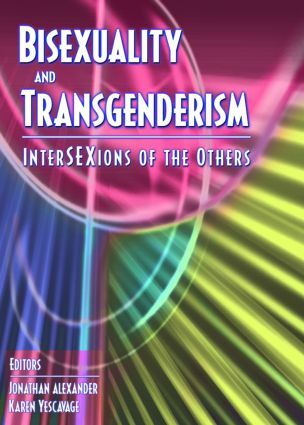 Combining the work of scholars and activists, professional writers and lay people, Bisexuality and Transgenderism: InterSEXions of the Others proesents ideas, thoughts, feelings, and insights from a variety of contributors who are committed to understanding—and deepening our understanding of—gender and sexuality. You’ll find scholarly essays, narratives, poetry, and a revealing interview with four male-to-female transsexuals, two of whom are married to women who also participate in the discussion. In addition, the book includes insightful chapters by well-known advocates of transgenderism, including Jamison “James” Green, Coralee Drechsler, and Matthew Kailey. The editors of Bisexuality and Transgenderism: InterSEXions of the Others make the provocative but crucial claim that the larger queer community looks at “B” and “T” lives as mere “add-ons” to “L” and “G.” In this book they focus attention on bisexuality and transgenderism—moving the “margins” to center stage and exploring how sexuality, gender, desire, and intimacy are constructed and circulate in our society. The book’s inclusion of voices and scholarship from Eastern cultures challenges our understanding of sexuality and gender constructions all the more, giving this collection a global scope.